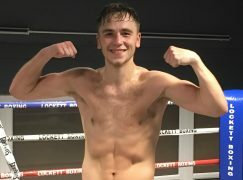 Welsh boxing’s longest active unbeaten record was in serious danger of being ended before Deeside’s Tom ‘Dazzlin’ Doran (17-0, 7KO) extended the streak with a dramatic win in a frantic four-minute war. In the opening exchanges, the 28-year-old picked himself off the canvas and the edge of defeat to drop Dublin’s Luke Keeler (10-2, 5KO) three times, finally flattening his fierce rival in the second round of a classic encounter. The middleweights met 14 months ago in the semi-finals of Prizefighter, Doran prevailed over the three rounds with a Unanimous Decision win on route to collecting the tournament’s trophy. 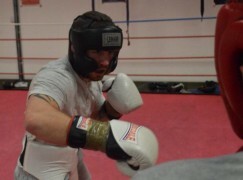 Keeler claimed he was hindered by a right hand injury but there were no doubts it was working this time. Doran was backed in to his own corner, which was run by Shotton Boxing Club’s Shane Thomas, when Keeler launched a rocket backhand to flatten his unbeaten opponent. After rising unsteadily and giving an acknowledging nod to his corner, Doran was given the benefit of the doubt by official Ian John-Lewis. In action reminiscent to Joe Calzaghe’s unforgettable knockout of America’s Byron Mitchell, Doran turned the tables when Keeler recklessly came for the finish. A left hook dipped Keeler’s legs and he slumped in to Doran, who was the only thing stopping the aggressor from crashing in to the ropes. Sensing Keeler was seriously dented, Doran took advantage with a sustained two-fisted attack. Doran was receiving several clean shots himself, though he absorbed the punishment better while Keeler was visibly more affected. The once-beaten Irishman eventually wilted and crash-landed to the canvas towards the end of the opening round and both were relieved when the bell sounded to end it, while observers were given a chance to get their breath back. Picking up where they left off, the pair went straight back at it in the second stanza. It was Doran’s cleaner shot selection and crisper precision that made the difference. Keeler remained eager and was made to pay for it when he dived in, allowing Doran the room to land a flush left hook, which resulted in Keeler falling on his front. A fearsome follow up attack saw Doran enjoy success with both hands and it could have been waved off before he delivered the final few blows. A straight right hand sent Keeler over for the last time, forcing the referee and Pascal Collins in the visiting corner to simultaneously call the contest off. The devastating victory saw Doran collect the WBC International title and he will now enter the top 15 of the organisation’s world rankings. Doran is in the hottest form of his seven-year career and has now recorded four consecutive knockouts, overall lasting less than 13 rounds. 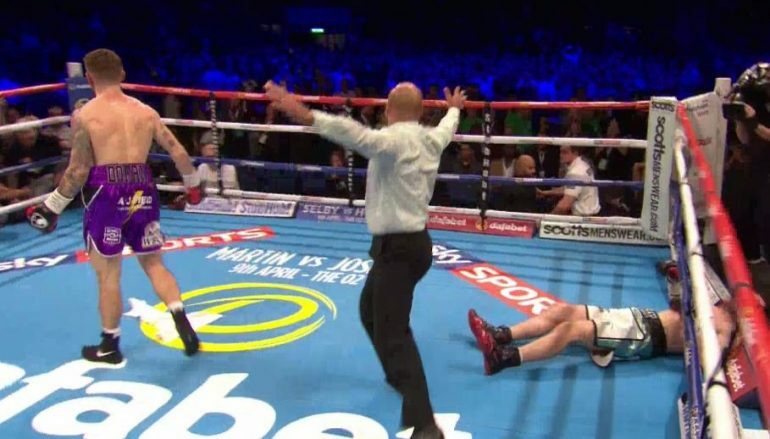 Doran opened the Sky Sports broadcast at Liverpool’s Echo Arena and made a lasting impression, exciting fans in one of the network’s most memorable fights ever. If the Welshman’s explosive performance somehow isn’t enough to secure him more television time, the relationship of his manager David Coldwell with Matchroom Sport’s Eddie Hearn will be key in opening more doors. 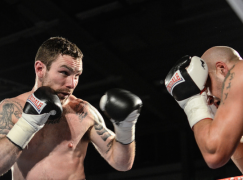 Following last week’s uncompetitive show in Sheffield, featuring IBF world welterweight champion Kell Brook and fellow big-hitting middleweight Adam Etches, Doran provided some much needed value-for-money action for the broadcaster. Four times a week, Doran works 12-hour shifts as an electrical engineer for Hawker Beechcraft and he was back in to work this morning. The unbeaten father-of-one trains each side of every shift, starting at 4:30am and finishing his days at 9:00pm. Following a similar short up-and-downer with Max Maxwell in 2011, Doran left the sport for three years but has returned to establish himself on the domestic scene again. The combined record of Doran’s seven opponents since coming bucket boxing is 87 wins, 27 losses and four draws. On the same show, Llanelli’s Robert Studzinski (3-28, 2KO) was stopped for the fifth time in five years. The middleweight came up against the smaller Scott Fitzgerald but the 2014 Commonwealth Games gold medallist was a expectedly class above, securing a second round stoppage. Elsewhere in the middleweight division, Newport’s Lee ‘Lights Out’ Churcher (13-3-1, 4KO) claimed the WBF Intercontinental belt with a second round stoppage of Hungary’s Balazs Horvath (24-17, 6KO). The show at the Pill Millennium Centre was sanctioned by the Malta Boxing Commission and not the British Boxing Board of Control (BBBoC).